Growth, whether in biologic system or in an intellectual one, is not a linear phenomenon. In the very recent past, transplantation of the kidney and its impact on the whole field of immunology and genetics has given rise to the entire field of transplant surgery. At the same time, a completely new specialty has arisen as a result of the work of Blalock and Taussig, Gross, and others -- cardiac surgery. In brief, growth within the field of surgery has been nothing short of remarkable in the past two decades. The transposition of muscle and musculocutaneous flaps is then an idea whose time has come. Because of muscle flaps, musculocutaneous flaps, arterialized flaps, and microsurgical techniques, the entire field of plastic and reconstructive surgery is undergoing a remarkable period of growth and metamorphosis. 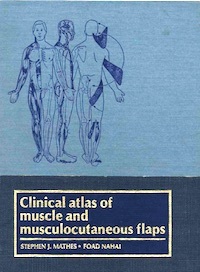 The need, therefore, for such an atlas of muscle and musculocutaneous flaps is immediate and obvious. The book, however, is a guide, and each surgeon interested in the field should use the book as it is intended. The atlas is not a cookbook to clinical practice, but rather is a guide to anatomic dissection so that clinical skills can be enhanced thereby. Drs. Mathes and Nahai have firsthand knowledge in the field. They have participated from the start in the development of this exciting aspect of reconstructive surgery. They have spent countless hours in the laboratory and subsequently in the operating rooms at Emory University and at Washington University to detail the precise vascular anatomy of muscle and the overlying skin. To the end of safe clinical practice of reconstructive surgery they have written this book.